This Salt Box Style home illustrates how Kitchen Workstation Furniture is a Flexible Design Solution for Any Size Kitchen! Open-plan home designs that allow one room of the house to flow into the next are reinventing the kitchen in today’s modern homes. No longer a cluttered, unsightly, work-only room tucked away from the rest of the house, the kitchen has reclaimed it status as the hub of the home – a place where the family gathers to dine, entertain and take pleasure in all the tasks and hobbies of home life. YesterTec’s heirloom-quality Kitchen Workstation Furniture (KWF) allows you to maximize your open plan kitchen with freestanding workstations that look good enough for your living area … but work hard enough for your kitchen. Any size kitchen can use real workstations. Available in a variety of styles, shapes, colors, sizes and materials, KWF can enhance any open-plan kitchen … even modestly sized spaces you might have thought too small to capture the spacious feel of this design option. By replacing traditional, continuous cabinets with KWF, the walls, ceiling and floor are exposed in and around each piece allowing any size room to blend into the adjacent areas in an open plan design. 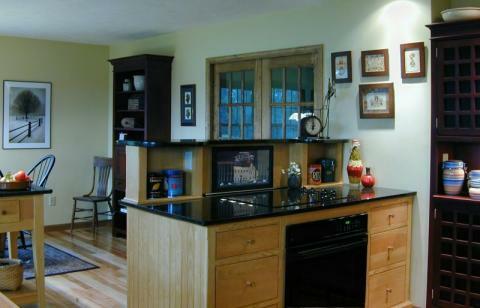 This kitchen is the hub of its modest New England Salt Box style home. 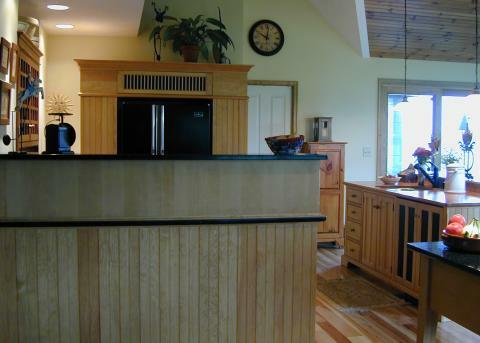 The country style kitchen is outfitted with four YesterTec pieces in Old English Pine and two in Bombay Mahogany with Cherry and Granite tops. The homeowners here have used KWF to take advantage of limited wall space, letting the room serve as a true center of activity, open to all the living areas of the home. In fact, a balcony is right above the kitchen that connects two kids’ upstairs bedrooms – so they can open their doors and talk directly to mom and dad in the kitchen! And a sunken family/sun room is beyond the back of the sink so guests and family members can relax close by, without being exposed to the mess of the kitchen. As you can see, the circulation moves through this room effortlessly as it should in a truly open, heart-of-the-home kitchen. It’s a very successful alternative to the ‘laboratory’ look of a typical kitchen designed with cabinetry and continuous counter tops. Maximize Character. There are endless places to add personality in a typical YesterTec kitchen. Here, two antique pieces have been integrated into this modest kitchen, blending beautifully with the KWF and adding character and style. But KWF allows the heart of your home to do more than just look exceptional. It turns it into a highly-functional activity center. 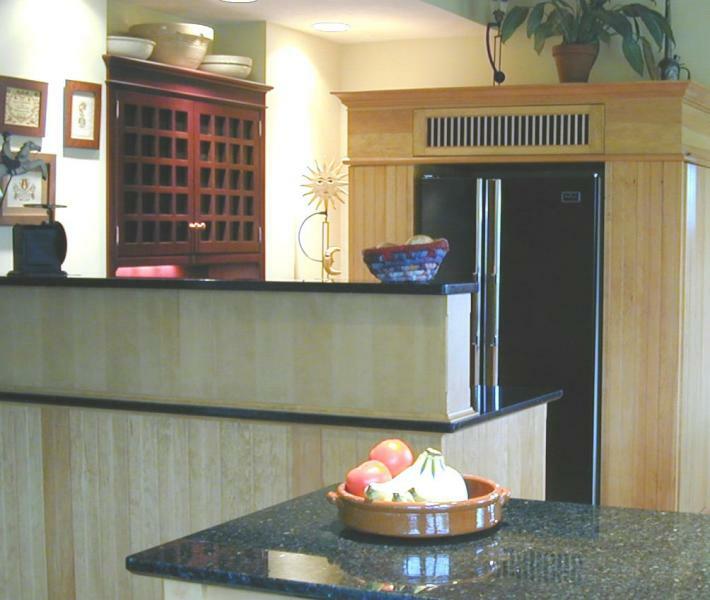 Take storage for example – in this kitchen, the refrigerator piece has two storage pantries. The left side pantry boasts six roll-out trays and the right pantry side is actually a bi-fold door that conceals six shelves. Plus, the dowel panel above the refrigerator and the panel above the right side pantry flips up for more storage. The owners lived in this house for six months before they finally filled up all the storage areas in this kitchen. Maximize Space. YesterTec’s workstations also maximize your use of space. Here, the grid door cupboard next to the range piece not only adds texture and panache – it features a shelf for the microwave. The range piece beautifully houses a downdraft telescoping vent, a cooktop and a 30″ oven. This is possible because with freestanding workstations, depths can vary so you can have different sizes to optimize the efficiency of each task. In fact, of the six pieces in this kitchen, none have the same depth! The deeper counter space around the cooktop and sink also creates deeper storage drawers, reinforcing the efficiency of the ‘work center’ concept. For additional work space, the homeowners use a freestanding worktable in this kitchen as a buffet for parties and as a production area when enjoying their hobby of baking. Even though hiding the appliances was not a priority for these homeowners, They still wanted real furniture for their kitchen. So YesterTec surrounded the exposed oven and refrigerator with a symmetrically proportioned piece of furniture, finished on a minimum of 3 sides, so that each piece looks and acts more like sculpture than cabinetry. In this way, the exposed appliance becomes integrated into the fabric or texture of the whole piece. But for those who do want to conceal their appliances, YesterTec’s KWF can conceal even the ‘hot’ ones! Designed with the open-style kitchen in mind, YesterTec has created special workstations to hide the mess of an ordinary kitchen, transforming it into an extraordinary living area. Some of YesterTec’s revolutionary pieces can conceal the typical kitchen elements that might seem out-of-place in your open style home. YesterTec’s exclusive patented U.L. Listed technology can completely and safely conceal major appliances, including standard, full sized electric ovens, cooktops, microwaves, warming drawers and any dishwasher behind beautifully styled pocket doors. Refrigerators and integrated dishwashers can be concealed as well, using only door panels to cover them. So now you can choose what you want to see and what you want to hide. Now, for the FIRST time, complete design control is back in your hands, and not at the mercy of appliance manufacturers. Next ArticleThe Kitchen Work Triangle: Concentrate on its Points! Previous ArticleStealth Technology Applies to Kitchens Too!